Draw, paint and turn photos into paintings using nothing but your fingers Choose from 20 types of artistic media, including Oil, Chalk and Fairy Dust Create natural brush strokes that look like the real thing Move, zoom, rotate, tap, drag and scrollright on screen Choose from 10 paper textures, such as Rough and Hot Press Specially designed for your touch screen PC, Corel Paint it! touch is a natural and fun way to draw, paint, sketch or even just doodle on your touch screen monitor. This digital painting software makes it easy for the whole family to get creative. Note: This software will only run on Windows 7 machines that have touch-screen capabilities. Corel® Paint it! touch™ allows you to draw, paint and even turn photos into paintings just by using your fingers! Created specifically for the Windows® 7 touch-enabled PC, this touch screen software makes it fun and easy for anyone to be artistic. OverviewCorel Paint it! touch puts creativity right in your hands. Perfect for parents, kids and anyone who wants to have fun with digital art, this touch screen software brings new meaning to the word fingerpainting. Get in touch with your creative side by drawing or painting right on your touch screen monitor. Turn a photo into a painting with a just few quick finger taps and a lot less mess! You’ll enjoy hours of doodling, sketching and enhancing images to make your digital art and photos come alive. Corel Paint it! touch—digital painting with your own special touch. Note: Corel Paint it! touch is already available with various touch screen PCs running Windows 7. Find out if you already have a copy or see where to get one. Corel Paint it! touch—digital painting software for your touch screen PC. 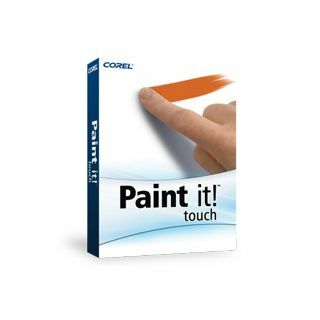 Specially designed for your touch screen PC, Corel Paint it! touch is a natural and fun way to draw, paint, sketch or even just doodle on your touch screen monitor. This digital painting software makes it easy for the whole family to get creative! Draw, paint and create stunning photo paintings—all with the touch of finger. Corel Paint it! touch is the easiest way to get creative with your touch screen PC. Choose from 20 different types of artistic media, including Oil, Acrylic, Watercolor, Marker, Felt Pen, Crayon, Chalk, Spray Paint, Pastel and even Fairy Dust! Move, zoom, flick, rotate, tap, drag and scroll—right on screen, using nothing but your fingers. Corel Paint it! touch uses gestures that are supported by the Windows 7 touch interface. Use the movable mixer pallete to mix and create distinct colors that you can use in your art projects. Select from 10 different photo-painting selections, including Oil, Watercolor Sketch and Illustration, and watch your photo magically transform into a digital painting right before your eyes. Use the ‘Welcome Screen’ to help you get started with creating your first masterpiece on your touch screen PC. Choose from 10 different paper textures, such as Rough, Hot Press and Pavement, to create realistic-looking art. Uses RealBristle brush technology to create natural brush strokes that mimic traditional art. Specifically designed for Windows 7 touch-enabled computers, Corel Paint it! touch takes full advantage of Windows 7 Touch features and your touch screen monitor.